Unwind and listen to all of your favourite hits from Dean Martin, Sammy Davis Jr. and Frank Sinatra with The Rat Pack compilation CD album from Intempo. Including tracks such as Autumn in New York, Come Rain or Come Shine and Young at Heart, this album is perfect for any fan of Big Band and Jazz music. A wonderful gift for music lovers, the CD has been remastered so you can enjoy 14 legendary tracks from your favourite singers with the best quality sound. 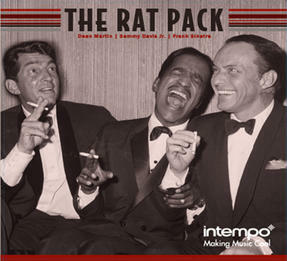 For original recordings of classics sang with style from the 50s and 60s, just add The Rat Pack album by Intempo to your CD collection. Expertly remastered for CD with outstanding sound quality, you can enjoy listening to the music legend at home or in your car. This record features 14 famous hits including Moonlight in Vermont, That Old Black Magic and Memories are Made of This. With timeless tracks, the CD will make a wonderful gift, to introduce someone you know to the Rat Pack or help expand their collection. The compilation CD comes in a case which will protect it from scratches and displays all the tracks so you can skip to your favourite.